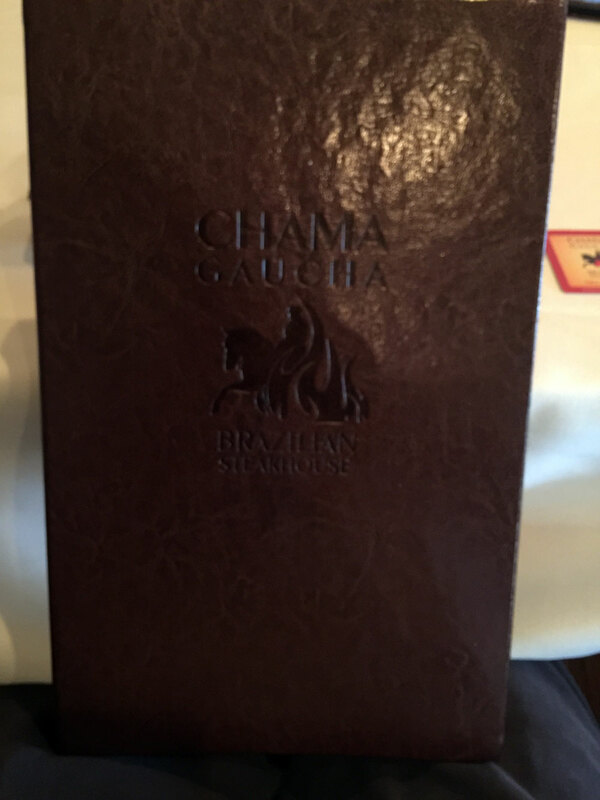 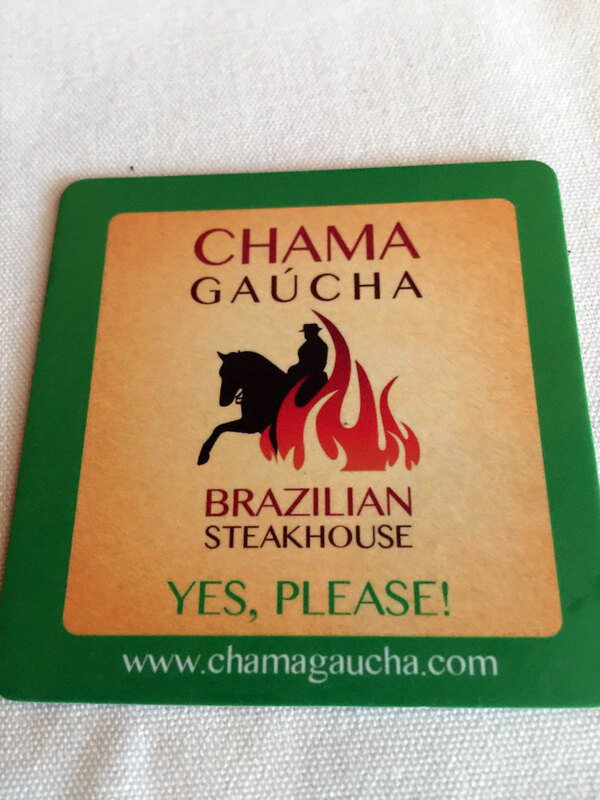 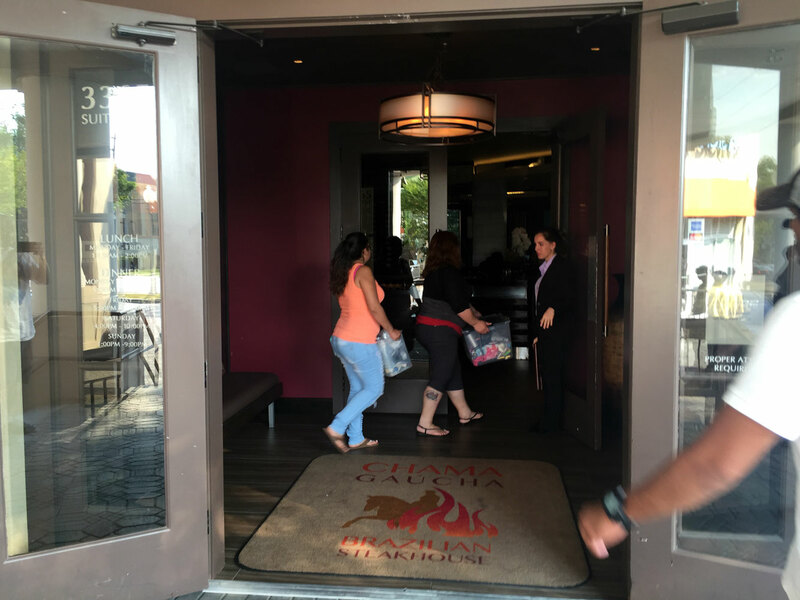 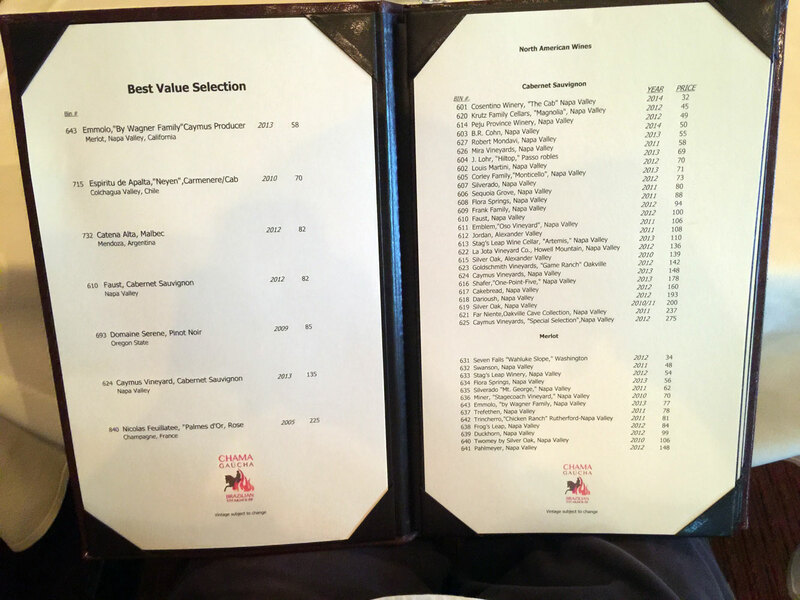 You can find Chama Gaucha Brazilian Steak House at 3365 Piedmont Rd NE, Ste 1350 Atlanta, GA 30305 pretty much in the heart of Buckhead. 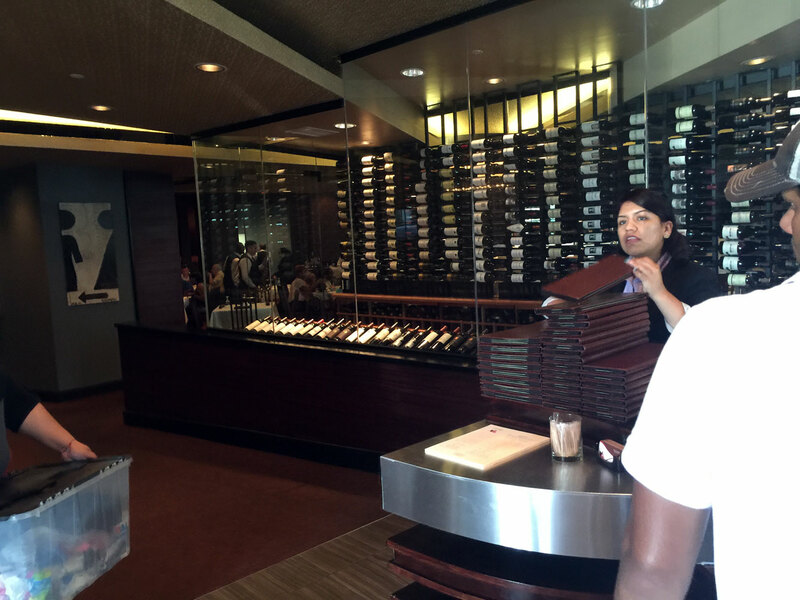 You can see one end from Peachtree and Piedmont streets but the entrance is really in the back, as is the valet. Of course with most eateries in Buckhead the challenge is parking - if you don't like to valet I suggest taking MARTA in and spending the day exploring. I mostly avoid Buckhead these days because of the parking situation - I simply don't have the patience for it anymore, especially with all the great restaurants elsewhere. 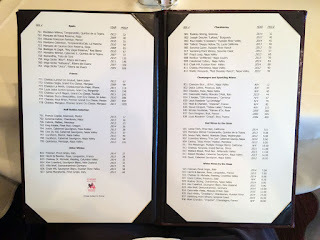 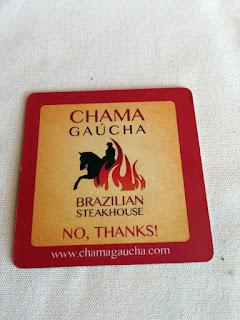 I decided with some friends to hit Chama Gaucha after the Brookhaven Beer Festival - we were basically buzzed and starving and felt like gorging on meats. 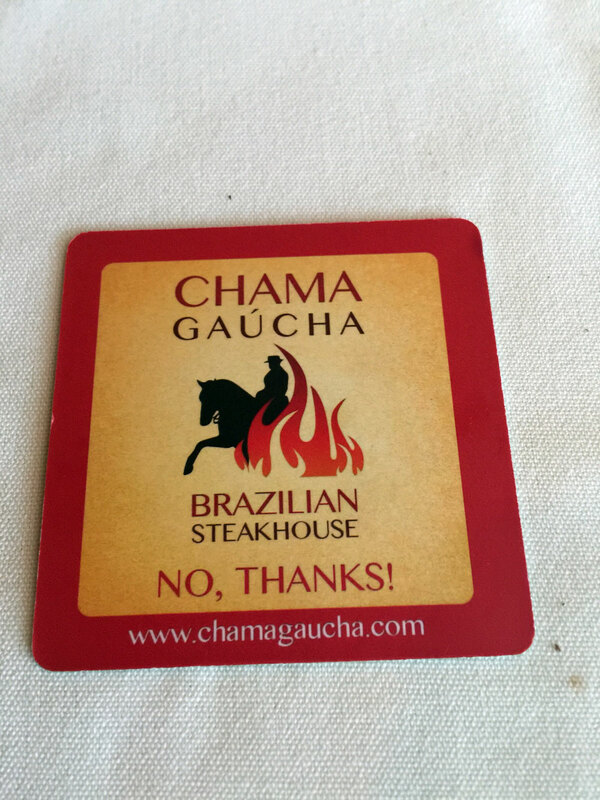 We'd eaten at Fogo not too long ago so I suggested Chama as an alternative. We used the valet and spent a couple of hours there. 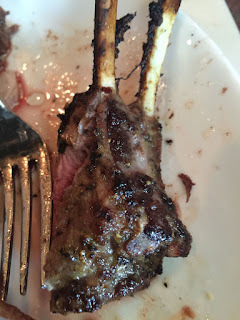 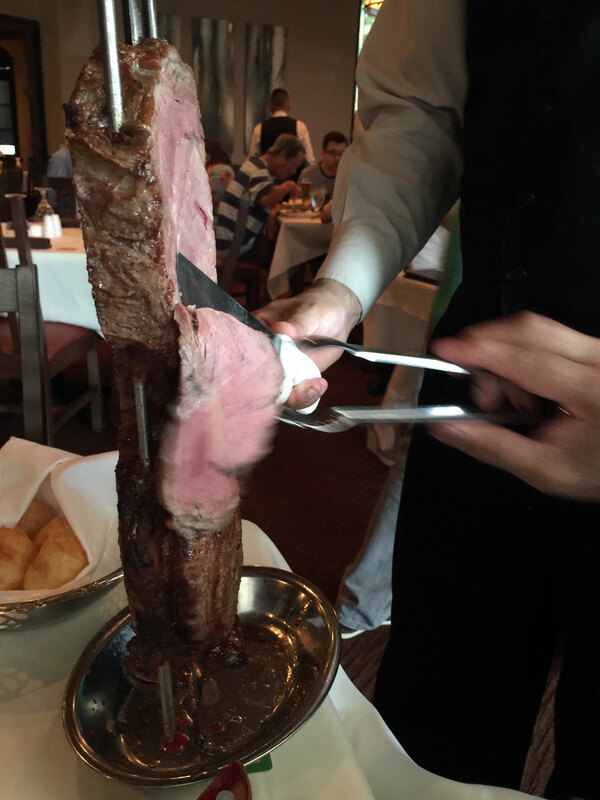 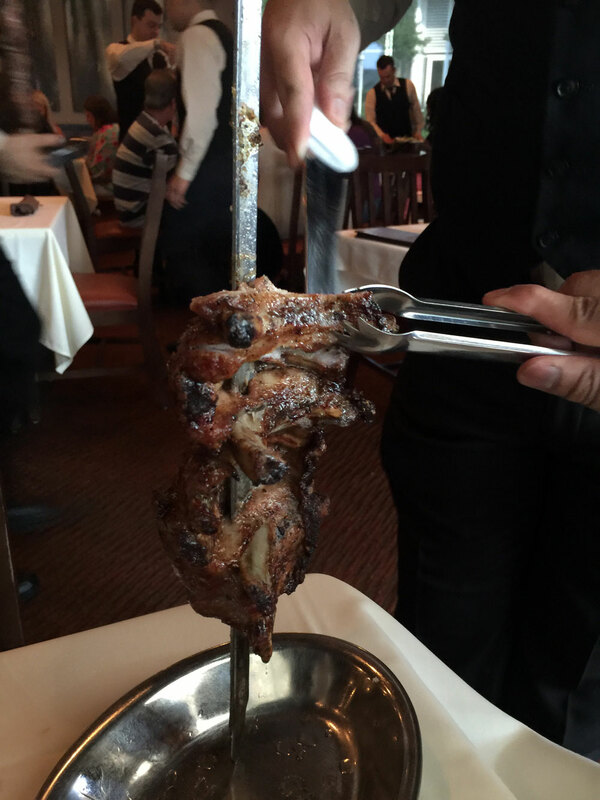 You may already know if my high opinion of Fogo de Chao so naturally you'll see many comparisons following. 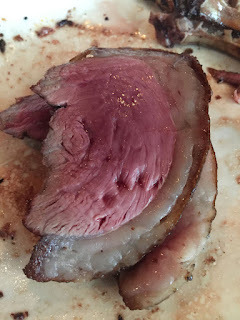 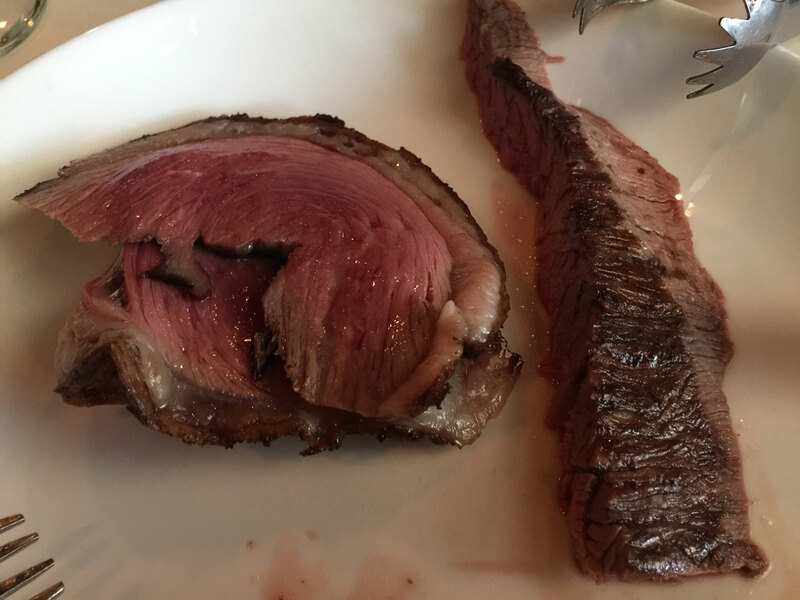 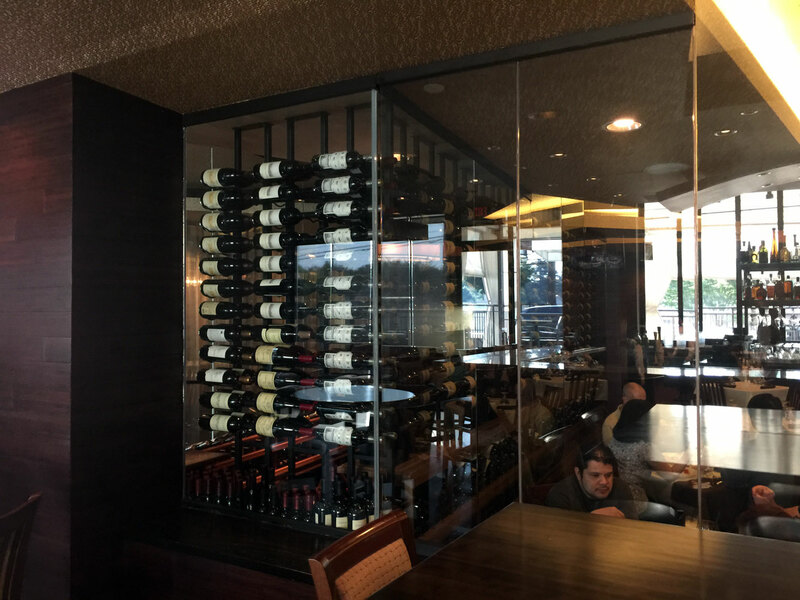 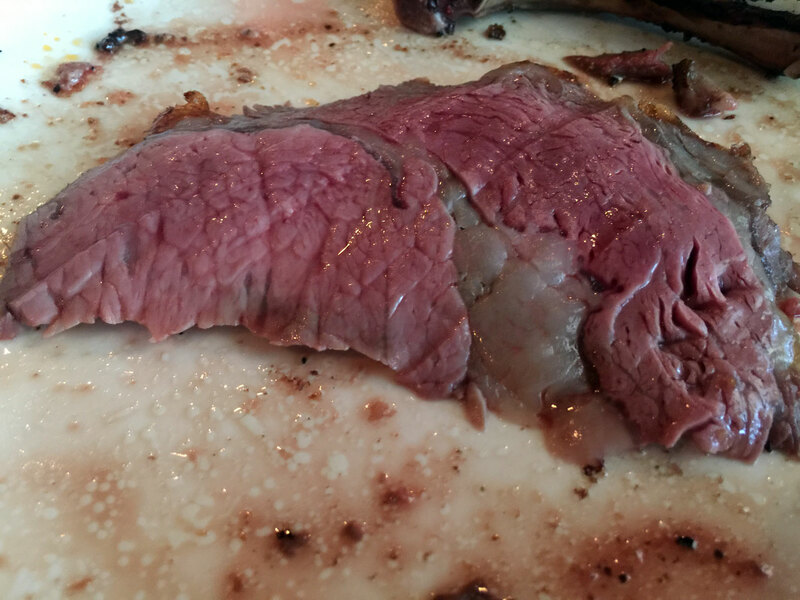 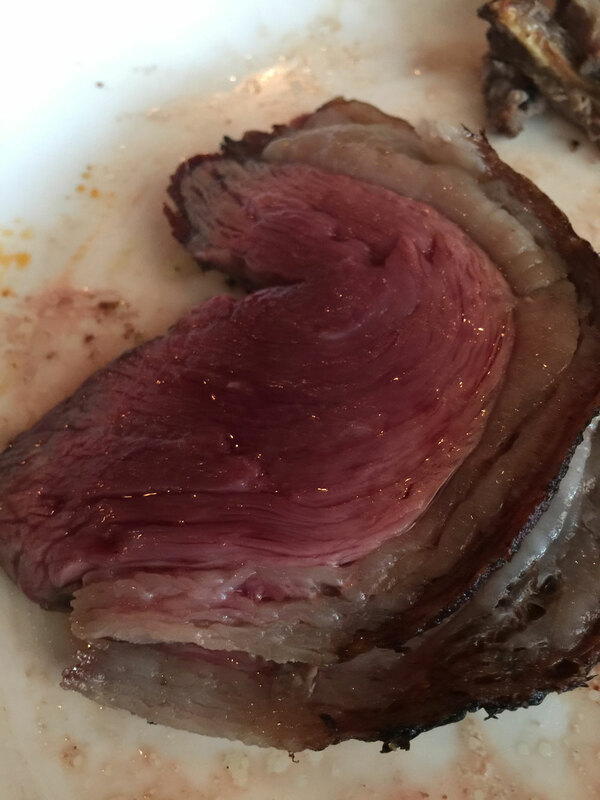 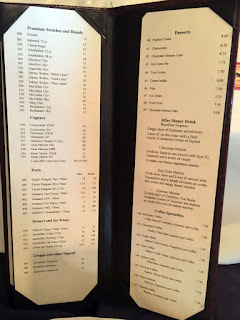 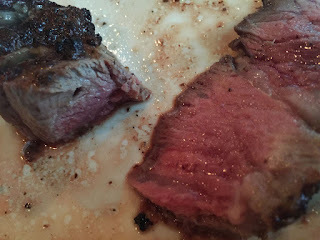 The difference between Chama and Fogo is stark - while the original Fogo de Chao is homey, well lit and a bit cramped, Chama is industrial, dark and very spacious - obviously the restaurant is looking for a bit different crowd. I think Fogo is also now looking for the same crowd - note the similar, industrial look of the Sandy Springs location. 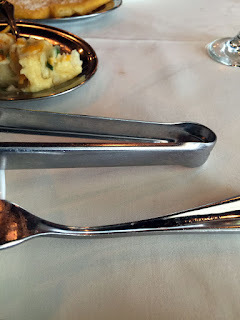 Which do I prefer from an esthetics perspective? 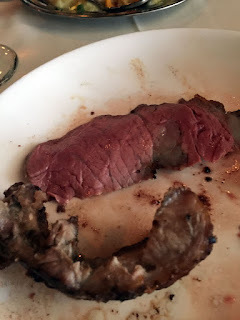 I actually like the original location in Buckhead of Fogo better - maybe because I've eaten there so often, but there are other differences as I'll detail shortly. When you approach the doorway you're greeted by a host station before a stunning array of wine bottles - seems Chama really aims to please the locals, who tend to drink quite a bit with dinner (not a bad idea, right?). 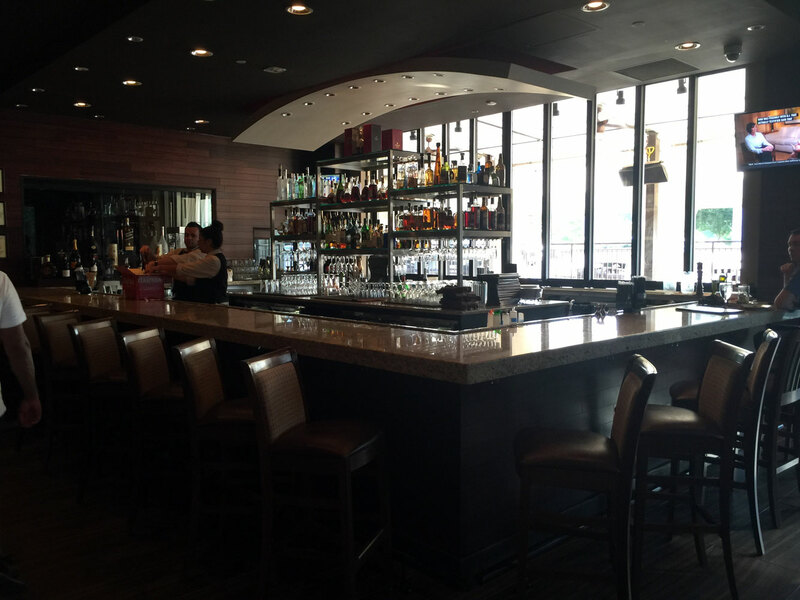 To the side is a full bar and a short open atrium that leads to several dining rooms. The inside is dark and a bit moody with tables well apart - it also feels very spacious which is both a good and bad thing. 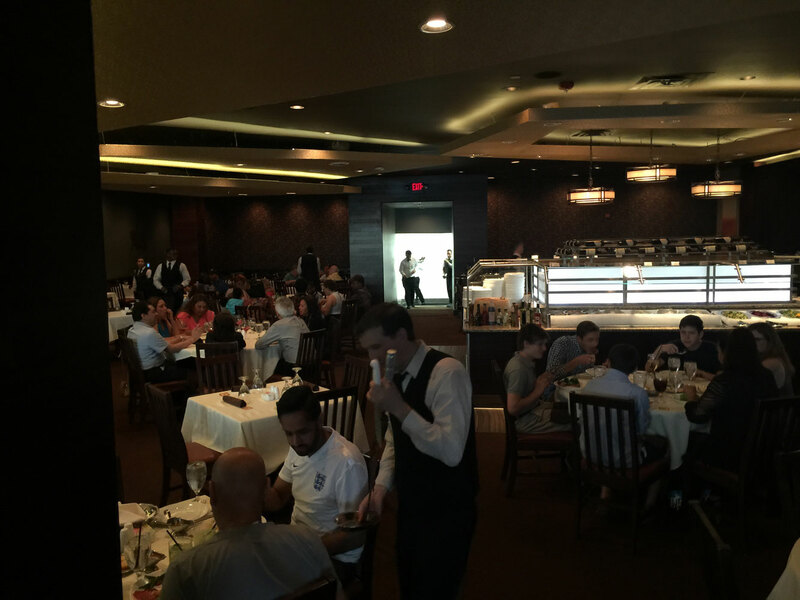 At Fogo the tables are close together so the servers are always at hand, as are the churrasco rodizio servers - there's always someone at your table as long as you want food. With the tables further apart in a much larger space, there were times when my plate was empty and I was looking around for someone - it's a strange experience and not something you normally see at Fogo. 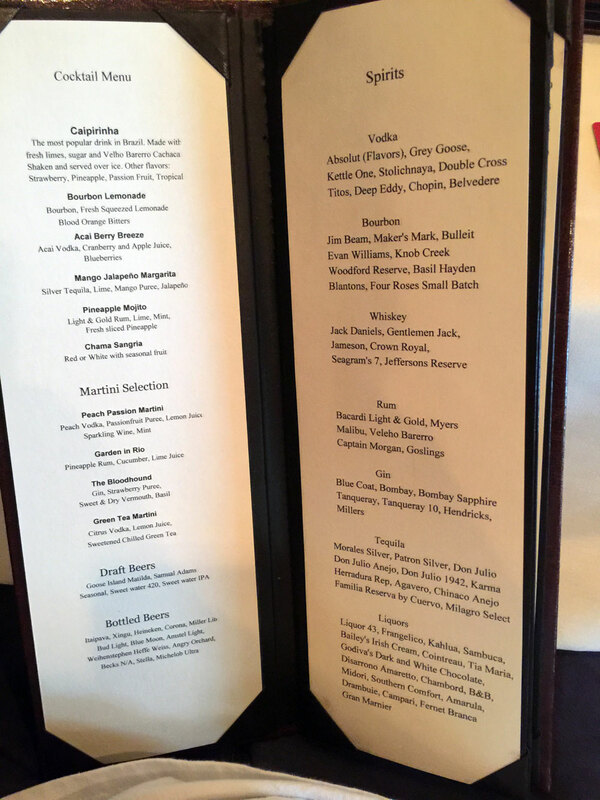 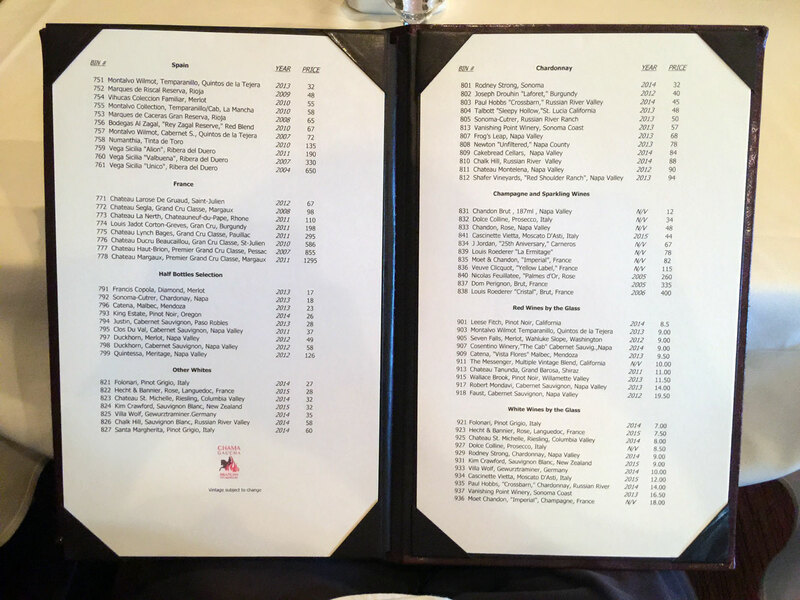 The menu at Chama is what you would expect - mostly drinks including the wine lists and beers, along with cocktails and specialty drinks. 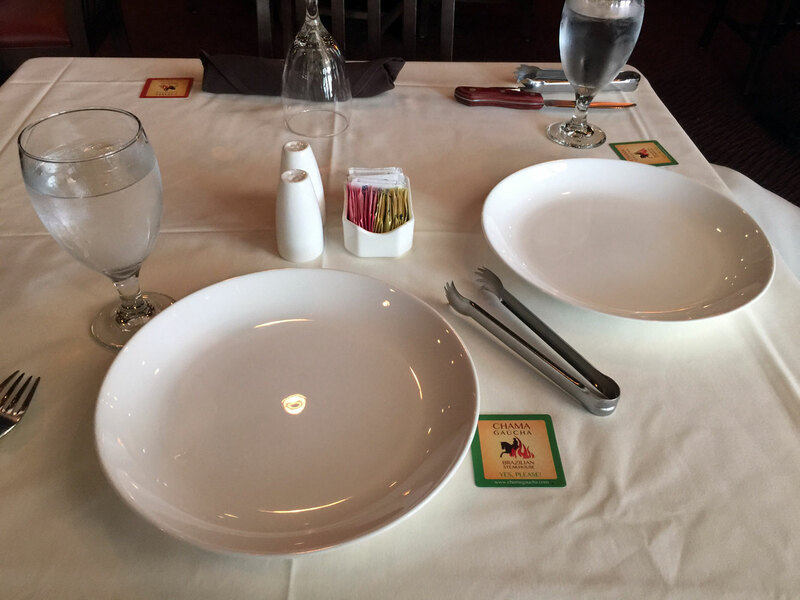 The table service is quite simple - white tablecloths, napkins and plates. At Chama you are given a a card that has green borders on one side (green = yes bring me meat!) and red borders on the other (red = I need a breather so stop asking if I want more meat!). 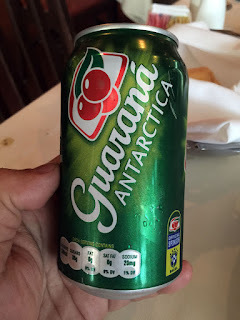 I ordered a South American soda "Guarana Antarctica" which was sweet, cherry and citrus. Not bad but I only ordered it because I hadn't had one previously - I basically stuck with water. We took a look at the salad bar but as with Fogo I tend to forego the greens and stick with the meats. It appeared a bit smaller than Fogo but it's difficult to tell as the layout was different. 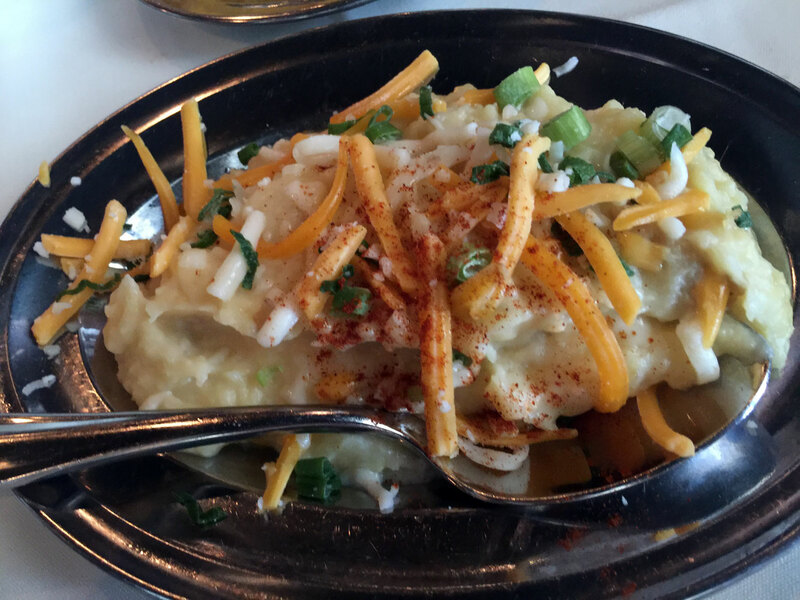 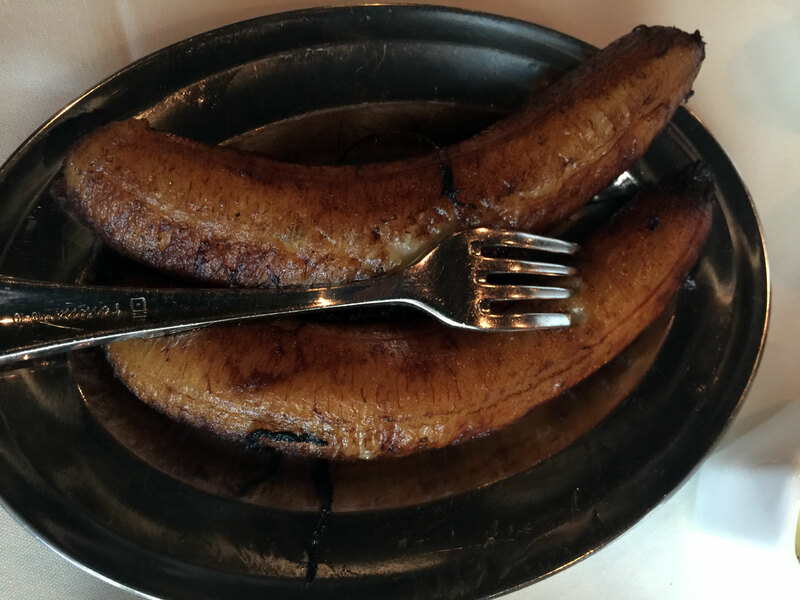 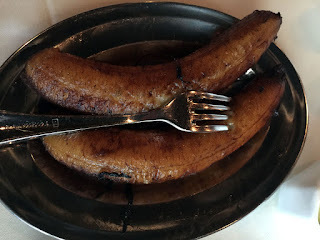 The table is brought plates of food - a creamy mashed potato, polenta cakes and fried bananas - this is similar to Fogo and provides a starchy contrast to the savory meats. 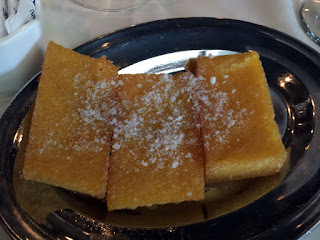 Of course I tried a nibble of each but basically ignored them - as I was there for one thing. The meat handlers came around and I immediately started piling up my plate and pretty much finished each cut prior to the next server visiting the table. 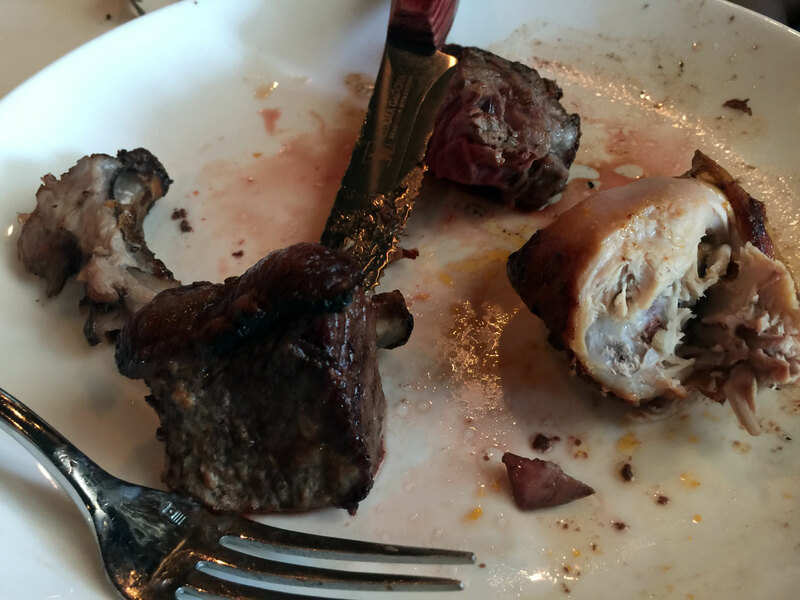 As mentioned previously, there were a few times when my plate was essentially empty - and interesting experience. 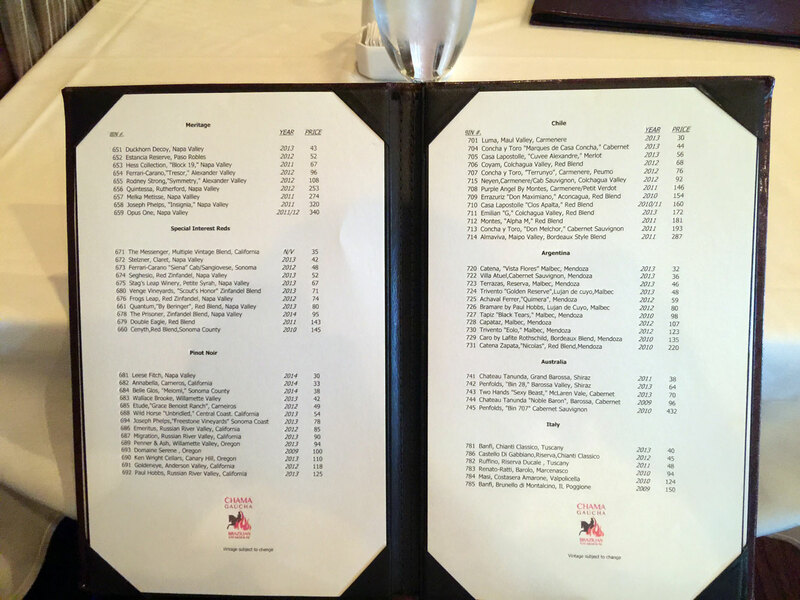 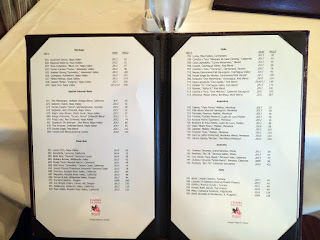 I found the meats here to be on par with Fogo - essentially fantastic cuts and some of the best you'll find. 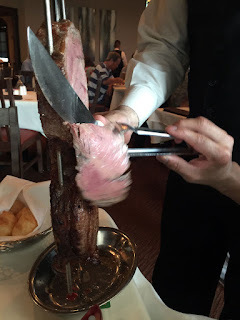 If you haven't had this style of cooking before, they basically brine the outside of meats on skewers and put them on a rotisserie over live flame - these skewers (more like 30" swords) are brought around and the outside bit is cut for your enjoyment. My favorite cuts are the filet, the sirloin and the pecanha (a semi-circular cut of top sirloin). I'm also a big fan of the lamb chops - I tend to pass on the sausage, chicken and pork - not that they're bad but South America is really known for their beef. 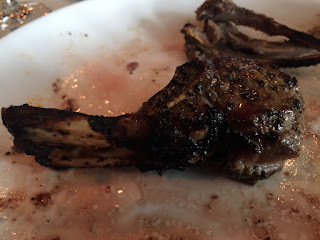 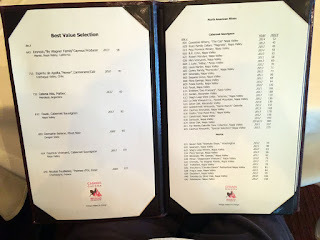 I thought service was good when it was around and the food was very good - personally I will continue to go to Fogo de Chao - it fits more like a familiar glove. 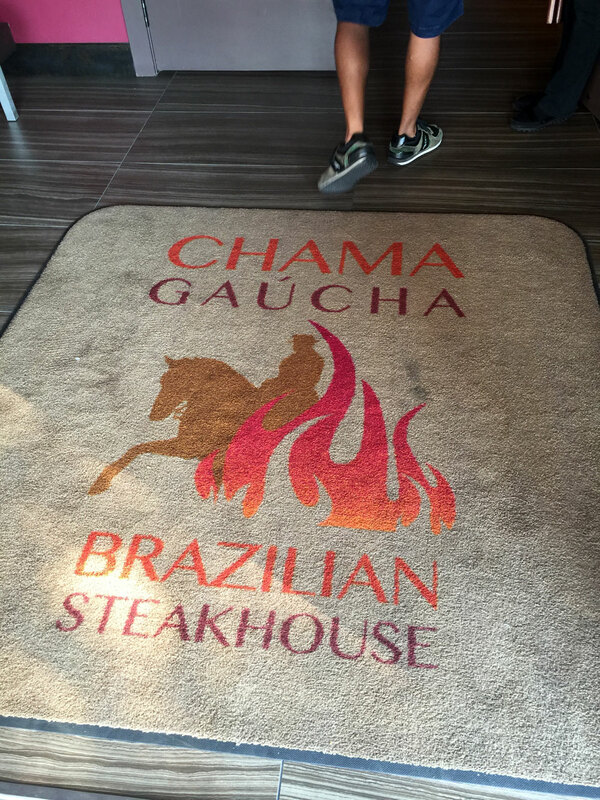 This place is nice - perhaps too nice for me?